• Join this adorable wobbly robot on his fantastical acroBUDic adventure. • Collect MOM’s ship parts with the help of new friend POD. She likes planets. A lot. • Explore an entire alien planet filled with excitement and wonder. And a Flungus. • Walking’s overrated - tuck BUD into Ball mode to boost, bounce and roll around the planet. • Take to the air and soar between floating islands like a big metal bird with the Power Glider. • Exercise those green fingers and overcome obstacles by spawning any plant you’ve found with the Floradex 3000. 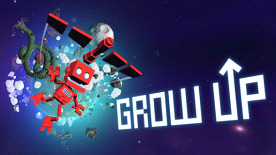 Grow Up, the sequel to Grow Home is here! You once again take control of B.U.D a robot looking for M.O.M- Wonder what that might be, eh? But this time you can team up with your flying buddy P.O.D to collect the lost parts of M.O.M to put her back together again! Grow Up is just as zany as it sounds on paper, and is a charming game from Ubisoft Reflections. You can scour an entire planet looking for parts of M.O.M, and now you have more ways of getting around than ever. If you're looking for a break from all the high-octane action games coming out, Grow Up might be for you!